A city-wide flood warning was issued by Krakow Mayor Jacek Majchrowski at 8:30 am this morning. The water gauge at Bielany shows the Wisła River is 25 cm above emergency levels. The emergency water level has been surpassed in 12 places along rivers in Małopolska, and water has reached warning levels in 14 places as of 1:00 pm. Consequently, a flood warning has been issued in several other communities of the Małopolska region, including Skawina, Kłaj, Pcim, Łapanów, Bochnia, and Zabierzów. Today throughout Małopolska 170 firefighters and 440 volunteer rescuers are participating in emergency flood rescue crews, which were called in almost 300 times last night and 100 times as of this morning. So far, only localised property damage has been reported mainly to pools, basements, and some residences. Last night barges were overturned and swept downstream as the Wisła River swelled from rain. The barges have been stopped by the Stopień Wodny Dąbie bridge, which has been closed to traffic as a result. The overturned barges do not currently pose a threat to safety and cannot be removed due to continually rising water levels on the river. The water level will reach its climax today between 1:00-4:00 pm but will stay well below the level of the embankments, according to experts at the Institute of Meteorology and Water Management. Traffic has also been closed on ul. Podbipięty, from the roundabout to ul. Marii Panny. With today being the first day of school nation-wide, students in the southern and eastern regions of Poland will have to brave a steady downpour of rain going to and from school. Snow and sleet have even been reported as a possibility in the mountains. The water level at its peak has surpassed the forecasted expectations due to heavy rain that persisted longer than expected yesterday. The water was 120 cm higher than emergency levels, with a total depth of over six metres. Emergency flood levels have been reached in 18 places around the Małopolska region and flood warnings issued in 19. 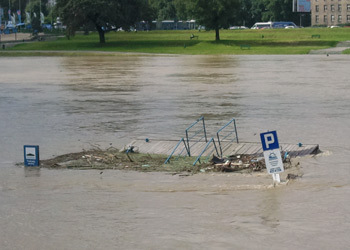 In Krakow, the water was so high that the tunnel under the Grundwaldski roundabout was closed to traffic last night. No rain is expected today, and the water levels have been steadily subsiding since reaching their peak. Surrounding areas have been hit harder. In Pcim a main road was blocked by surging waters from the Raba River; 50 evacuated people in Gnojnik have not yet been able to return to their homes; train tracks and roads were flooded in Zembrzyce making the route from Sucha Beskidzka to Krakow impassable; a man was killed by an electric shock at a quarry in Lubień while securing the area against potential flooding.